After a clean reinstall of windows, l've decided to get back the command center. 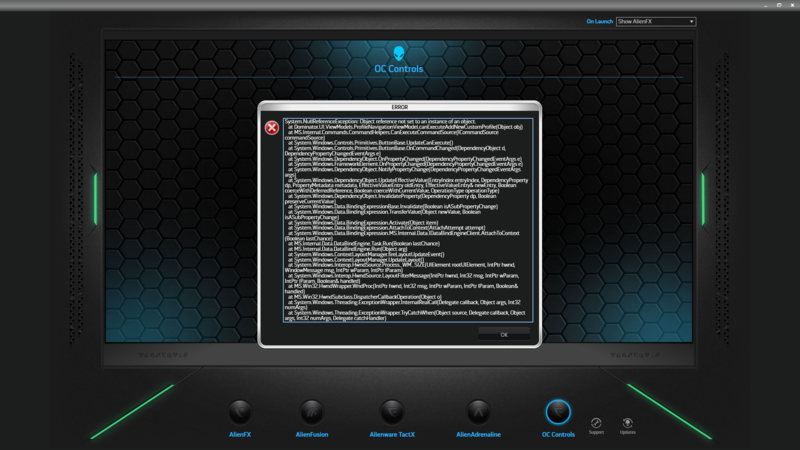 As you may be aware, OC control doesn't come with CC, and must be downloaded separately. Actually it doesn't work so bad that after the huge error log the whole command center goes down and close. I think I had a similar problem with my 13 R1 a couple years ago. I'm pretty sure I had to install the Intel Chipset Driver, then Intel Dynamic Platform and Thermal Framework, then Alienware Control Center, and lastly OC Controls. I think that the log is saying the software can't find the drivers to modify. The "System.Null.Reference.Exception" at the top is the "I can't find" and the needed drivers are the various "objects" and "DependencyObjects." I have had this happen in the past but can't remember exactly what the fix was. Is CPU performance mode enabled in the BIOS? Did you try removing and reinstalling the entire CC application?